We’re sure you have questions, which is awesome, because we have answers! Here is information on where to find other information about the game, how we’re running it, and how to play. If you think of something not covered here or in the forums, please feel free to contact plot with your questions. Is there a rulebook I can buy? The Eclipse rulebook is available for free in PDF format here. If you do not have acrobat reader, or need a hard copy, please contact plot. Hey, there’s this thing in the Rulebook I don’t understand! Where can I get answers? You can post your question on the forums, if it hasn’t already been answered there. I am totally new to LARPing, and don’t understand these random terms people keep using. Is there a list of terms somewhere I can look at? I’m glad you asked! 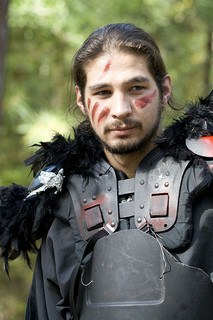 There is a Jargon page for general larp terminology. Check these out, and then refer any other questions to the forums. You can find a list of the plot and campaign committee members here. If you need to contact a specific member of staff, you can PM any of them on the Rule of Three boards. Where will the game be held? Our primary site will be AH Stephens in Crawfordville, GA with a secondary site at Indian Springs in Flovilla, GA. You should check the Events page to verify which site the game you want to attend is at. Where can I find directions to site? Directions will be available here. Otherwise, you can look up directions on the sites for each of the relevant state parks. Where can I register for an event? Pre-registration is available on the Events page. It’s event time! What do I do now? Check out the Event In Brief page for a basic overview of how an event goes, and what to do once you’ve arrived on site. The event is over! What do I do now? Go fill out your Checkout and Feedback forms, whether you are a PC or an NPC. We want to know how your event was! So when I am filling out my Checkout Form after the event, I see there is something about Between Game Actions. What are they, how do they work, and what am I permitted to do with them? Capitalist – Basically use each of or just one of your 3 BGAs to earn money via a Production skill or Profession skill. Learning – Learn Psionic effects (please specify which ones “I learn a 3rd Tier effect” will get you the response of “Please specify which you want to learn”). Learning an effect requires a psion of at least +1 level higher than the effect you wish to learn (or a master). The teacher may be a PC or an NPC. Cybernetics – You can get cybernetics installed, provided a doctor has agreed to do it in-play, or you have one in BGAs you have easy access to. If you feel that you need an NPC’s cooperation for something, sending an IP letter is the best way to do it. Sending a letter to an NPC generally doesn’t require using a BGA, but you will need to actually write and send the letter in character, via email to plot. If you wish to ensure that the letter is sent securely, you may spend a BGA, to signify making a special effort. You can also buy 1 extra BGA per event at a cost of 3 Buttons. BGAs will be open for two weeks following an event, if you don’t get them in by then, you miss your window for that between game period. With so many research actions and such, we need that time to respond. How much build did I get? The event “blanket,” or build that everyone gets for an event, is typically 7 CP. On top of that, you may buy up to 3 extra build with Buttons. This is called, “capping out”. If you are nominated for extra points by another player, this subtracts from the amount of button you need to spend to cap out. So if you are entitled to 1 extra CP from nominations, then you get a blanket of 7, plus 1 from nominations, plus 2 from Buttons (a total of 4 Buttons). Typically, you should always choose to cap out; logistics will handle the bonus CP, if any, for you. How do player CP nominations work? Player nominations are a way to recognize people who have helped you out, made your game cooler, or otherwise impressed you in a given game. You may nominate up to 3 people for extra CP. Any extra CP awarded is given in lieu of Buttons expenditure for capping out. How do I get started making a character? The Creating a New Character page is a good place to start. You may also want to check out the Races and Planets pages for information you can use to start building your character concept. Who do I contact if I have questions about my character? Questions about characters should be directed to Eclipse Plot. Now that I have this awesome concept, how do I go about fitting it into the game? You can join the discussion on the Rule of Three boards to see who else is playing your race, culture, martial discipline, psionic style, or the like. Once you’ve got your Culture Packet from plot (you’ll receive it after emailing plot with your basic, single-paragraph concept), Eclipse plot is happy to help players develop their stories. Can I play a half-breed race or culture? Within reason, yes. You could be an Imperial who was born with a mutation and your parents hid you to be raised in the Fringe. Or you could be a Meurlain Web Guide who found they preferred the Imperial life and joined the Imperial Wainwrights Guild to serve a Great House. You could even be a Nasu who took the body of another Tribe or human culture and indulged the memories of your host. However, there are no half-breed races at this time. You cannot be the love child of a Dahhak Romeo and a Kshathran Juliet, doomed to being torn between worlds. The Tribes are simply not genetically compatible enough to produce that kind of offspring (nor can humans produce offspring with Tribes). Be aware though that players generally have an easier time integrating the more they indulge in the template of a single culture/race. Beyond that, just play what you think you’ll have the most fun with. Is the culture description I see on the website the only information I get about my culture? No! Once you pick a culture, you will get a much more comprehensive culture packet, which contains (hopefully) everything you will need to understand where your people come from. This packet is only available once you have firmly decided upon a culture, however. You may express interest to plot by emailing them; we ask for general details such as name, preferred culture, and a very basic concept. A single paragraph description is sufficient. So I’ve got my packet, started my character history, and I have a bunch of questions! What do I do? If you’ve let plot know what culture you’re planning to play, ask them to add you to the board for your culture on the Rule of Three forums. Many questions may be addressed there. If you want to work out concept specifics/check details with plot, just email us. We will do our best to get you a timely response. How many character points do I get at character creation? Players have forty (40) starting character points, for purposes of “at creation” skill costs, with three (3) additional character points if the player has turned in a character history. Character histories may be submitted up to thirty (30) days after the first event that the player attends as that character, and must be approved by Eclipse staff in order for these character history points to be applied. Players have one-hundred and ten (110) additional “experience” character points that do not count as starting or “at creation” character points. Players are allowed to take up to ten (10) points of Disadvantages at creation, and these ten (10) points are counted as “at creation” points. Disadvantages may not be taken without a valid character history on file. On top of this, new characters may buy up to an additional fifty (50) build with Buttons (2 Buttons gives you 1 build). This purchased build cannot be used for “at creation” skill costs, and must be counted as additional “experience” points for the purpose of buying skills. Skills which require in-game training/unlocking/etc may be purchased, but may not be used until the requisite training/unlocking/etc has been performed. Are there any restrictions on how I spend my starting points? Character points may be spent in any way that the player desires. There are a few exceptions to this for certain combinations regarding Martial Disciplines and which settlement your character is from. Players are encouraged to build characters that “make sense” rather than “min-maxing” or “powergaming” for a perceived best build. Some abilities have a different cost, or are even unobtainable, once a character is created. Advantages and Disadvantages are traits that you can buy at character creation to make the game easier, or else more challenging. Taking an Advantage (such as Fortune, Acute Senses, Rapid Healing) costs “at creation” character points. Taking a Disadvantage (such as Mute, Sickly, Fast Bleeder) gains you up to 10 “at creation” character points. Point values are based on the severity/benefit of the Advantage or Disadvantage, and are available in the Rulebook. Talents are the myriad skills and abilities used by characters to create things, represent learned knowledge, or perform actions such as healing the wounded or disabling security measures, such as traps and locks. I hate the Abilities/Talents/Advantages I bought at creation! Can I change them? New players are allowed to re-spend their characters after the first event that they attend, if desired. What happens if my character takes a wound in battle? Can I be healed? It depends on where you get hit. The Eclipse world uses a hit-location system, meaning that your character’s body is split into five hit locations. Your right arm, left arm, right leg, and left leg each count as a single “limb” location. Your chest is called a “torso” location. When you take a hit to one of your locations, and you don’t have things like protective effects, maneuvers, or armor to negate it you take a wound to that location. Some wounds are more deadly than others and multiple locations being wounded causes different results. Taking a wound in your left leg, for example, would mean you would need to take a knee to represent your leg being injured and thereby unusable. More information on wounds, their effects, and how to heal them can be found in the “Wounds, Healing, & Death” section of the Rulebook. How do I get started as a full-time volunteer? Speak to a member of Plot and let them know that you’re interested in full-time volunteering/NPCing. Filling out the NPC registration form is also a good start. You will be asked to sign a safety wavier at your first event, and a sportsmanship agreement. As a volunteer/NPC, what should I bring to an event? At the very least, you will want a set of black clothing — black pants & shirt, with more or less layers depending on the weather. You will also want comfortable shoes, ideally something reasonably appropriate to the setting (sneakers are fine). Weapons, armor, and other necessary props will be provided for you. If, however, you have something really cool that you want to bring, or you know you’ll be doing a specific NPC during the weekend, feel free to bring extra stuff. So I’ve just arrived on site… what do I do now? First, you’ll want to go to the Tavern/Mess Hall and sign in so that you are credited with your Buttons for NPCing. Next, you’ll want to report to Monstertown and stow your gear in your cabin/bunk, and check in with someone on plot. If we need you to do something specific right at the start of play, you’ll be told then so that you can get ready. Monsters who arrive on time for it should also attend Opening Ceremonies. As an NPC, will I just be fighting all the time? Not necessarily. We try to divvy out the speaking roles to those who haven’t got a chance to play a named NPC yet. The more you NPC for us, the more roles you’re likely to get. If you prefer to just fight, or have to be non-combat for some reason, let Plot know, and we’ll see what we can do. Please check out the Volunteering page first. If your questions aren’t answered there or here, feel free to email plot. Buttons are a reward for players and volunteers for participating in Rule of Three games. They can be spent on PC creation in a number of ways. What can I use Buttons on? You can find a list of uses for Buttons here. Other uses for Buttons will be at the discretion of Plot. How do I get Buttons? Volunteer! There’s many forms such volunteering can take, whether it is full-time NPCing, doing monster time as a PC, or making props, weapons, and/or costumes. Feel free to contact us, or check the out of play boards on the forums to find out our current needs. Also, you can donate money to the game for various purposes on the Donations page, in return for Buttons. Where in the universe is the game going to take place? The principal game locations can be found here. The primary locations are Gate Town and Iron Town, two colonies located on the planet Eclipse. When is the game going to take place? How am I supposed to remember what year it is now in the game if I need to? The game began in 2007, and the in-play year was 157 AGW. The last digit is always the same for both the in and out of play years. So 2008 was 158, 2009 was 159, 2010 was 160 and so on and so forth. Why would the PCs have come to Eclipse to begin with? The galaxy has been at war with the Thinking Machines for the past few years. It only recently ended, but before it did there were too many stories to ignore that seemed to point to Eclipse being at the center of it all. The robots seemed hell-bent on getting there at the time. Ancient stories of the Tribes seem to talk about the planet as though it were the very cradle of creation. There are plenty of reasons to have come to Eclipse initially, though coming up with your personal reasons might be a good thing to consider when writing your character history. Okay. But what about leaving my warm, safe settlement for the game locale(s)? Well, you wanna play the game don’t you? 😉 Some popular in-play excuses seem to be wanting to meet the people who reportedly ended the war. Some people want to train with them, or just generally be where the action is because you know it’ll be wherever these guys are. Maybe you just like being on the most frontier of frontiers, or you like a challenge in life. Maybe you just got tired of seeing the same faces around the settlement all the time and wanted a change of scenery. Maybe you’re running from your past, your memories, or that crone of an old lady who just won’t stop asking you to marry her granddaughter. The possibilities are endless. What is the general rate of literacy in the world? In general, universal literacy is extremely high. PCs do not have to buy read/write as an advantage and Illiteracy is not available as a Disadvantage. What is the likelihood of having traveled widely in my characters lifetime? It depends on the culture, Imperials didn’t travel much before the war unless they were in the military. They just liked their creature comforts too much, and the Fringe didn’t care for their kind to drop in unannounced. The Meurlain were the primary source of transportation in the galaxy, and so many went wherever they liked, whenever they liked. Fringers were generally too occupied with just surviving on their home worlds before the war, but if any human culture has the wanderlust bug it’s these guys. Dahhak generally go anywhere, but would always steer clear of Kshathran space as there was still some hurt feelings between the two races. Midir have been scattered to the winds ever since they lost their home world to the machines. Kshathrans largely go where they like. Yazatas are some of the most outgoing of the Tribes, but preferred the deciduousness of their own world for the most part. Nasu will go wherever a healing hand or peaceful mediation is needed, as they see few higher causes than to unify all life. Suzaki roam all the roads of Eclipse as they like, and it’s only been recently that the Atlanteans have begun exploring outside the continent of their birth. Travel between Tribe and Human space wasn’t really all that common until a little less than a decade ago. All said and done though, most Humans still stuck to Human space and Tribe to Tribe space, with Vohu (“Haven”) being a solid melting pot for all. Anyone and everyone was welcome on Eclipse. It quickly became the go to planet when the war really escalated. Now that the planet has hopped galaxies, it’s the only planet people can go to anymore; they live on it. What would a typical PC know about other cultures? Generally, a PC would have access to as much information about any given culture as is provided on this website. People are getting to know each other more and more these days since the settlements are such a mish-mash of people. Has the average person ever seen psionics/mutations/cybernetics? Everyone and their mother has probably heard about each of these things to some degree; enough to know that they exist. How they feel about them though and the extent of their knowledge in how they work, what people can do with them, is entirely dependent on the person’s culture. Mutations are by far the most mysterious, only having really come to the notice of geneticists in the last hundred years. That said, every racial page has a listing at the top of the descriptions on how common or rare a particular attribute is in their society. Apply those rankings to your concept and you should be good to go. My character/culture has a history of dealing with cybernetics/mutations/psionics/etc poorly. How do I deal with other PCs who may possess these qualities? When colonization of Eclipse first began, people who come to live on the main continents had a tendency to work together, despite mutations, cybernetics, or psionic histories. There were simply too many other things on the planet to worry about such as the wildlife, or finding food. Then the war happened. The Machines destroyed planet after planet without prejudice. It was a common conclusion that humanity’s (and the Tribe’s) best chance at survival in the galaxy was the decision to form a unified front against this foe. Sure, it took treaties, civil wars, and countless skirmishes, but the largest portion of the survivors on Eclipse in the settlements now seem to be on the same side. Granted, that doesn’t stop a Kshathran from giving a Dahhak a dirty look once in a while, or an Imperial from being unwilling to use the same shower just after an advanced Fringer Mutant finished drying off… but the common theme these days seems to simply be that we all have bigger fish to fry. We’re all just trying to survive from one day to the next. What role does religion take in society at large? The universe of Eclipse has many religions. There’s the monotheistic Church of Eheih among the Imperials. Or there are the pantheons of the Tribes and Fringers which, oddly enough, seem to mirror one another in many regards. Despite there being so many gods and goddesses to choose from, many of the Fringe and Tribes tend to favor one deity over multiples at once. There’s no harm in spreading your devotion among the crowd, but sometimes you just like that little Oomph to get where you’re trying to go in life; especially if you feel a resonance with one over the other. It was common for entire planets in Tribe space to favor a single deity more than another, though they never forget the purpose of the rest of the pantheon. Faith plays a strong role in many areas of this game, though what you have faith in is of your own choosing. It’s not always a deity for some. Does this game have a lot of woojoo stuff? More than many might think for a science fiction game. Sometimes the woojoo is more psionics-oriented, sometimes it’s faith-based. 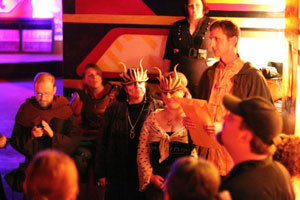 Sometimes it’s “other.” That’s where a lot of the “fantasy” aspect of our sci-fi/fantasy larp comes in. We try very hard to keep everything in our games for a specific reason, so if you find things are happening that don’t quite match up to the perceived paradigm of a science fiction universe, don’t fret. Just take it in-play. We assure you, there is a reason. What is the general level of trade on Eclipse? Merchants? Smugglers? Black Markets? Eclipse has always had trouble getting what they need the instant they need it, but that’s common with frontiers and colonies. There are a few merchants and smugglers out there who can be relied on to show up eventually though, and they can generally get anything you want your grubby hands on if you’re willing to wait… and you’re willing to pay the price they’re asking. With the war having just ended, trade is slowly resuming. The Suzaki are happy to facilitate, but largely work as couriers. Supplies are in high demand everywhere now that Eclipse has been cut off from all the resources the Origo galaxy had to offer. War has devastated supplies, and technology availability. Is there a well-established system of space ports and trade routes like in Star Wars? How do people get to other planets? Not so much since the war ended. All trade is solely on Eclipse alone. Space ships are practically unheard of in the Eclipse universe, but a few do exist in stories. There used to be Webtrains in the Empire for transporting siege troops and supplies, but these only went from the largest planetary Gates to the next. Before the war people traveled predominantly via the Web Ways (lighted, ephemeral pathways that exist between planetary dimensions) via trained professionals with a gift for Astronavigation, called Web Guides. Meurlain have the largest population of Web Guides of any culture, but many are available for hire by most anyone. You can read more about interplanetary travel here. How well explored is the galaxy? The players just recently came to the galaxy they’re in currently, and there has been no exploration as everyone is too busy trying to relearn how to survive on a frontier world. Eclipse itself has not been much explored, due to the extreme lack of high-tech engines and other land/sea modes of transportation.